Let's see - the US is involved in not one but three shooting wars, and on the one day of the year dedicated to the memory of our war dead, we get to see the BID, Smith, and Englnder congratulate each other. Oh, and hand out balloons and FREE bags of popcorn! Can you say silly beyond words! I know you can! 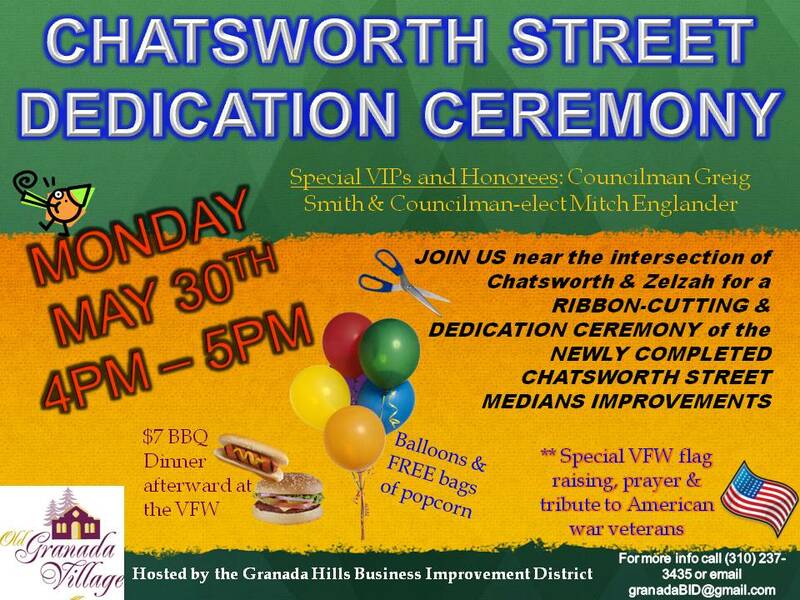 The planned community dedication tommorrow of the Chatsworth Street Medians Beautification Project is being held in conjunction with our local VFW Post of Granada Hills and in tandem with their Memorial Day barbecue reception . The day selected is also being utilized as an opportunity to provide intersted local citizens to purchase Rememberance Bricks at the Rotary Veterans Triangle by which the BID sponsored the Redwood Pergola seating area and was deicated on Memorial Day last year. The dedication tommorow also provides a community celebration in the culmination of the Granada Hills Business Improvement District decade long effort to improve the look of the original ''Granada '' township.The received and expressed positive response of this latest BID centerpiece installment by residents, business owners and commerical property owners during the the past eight weeks of construction and scheduled completion has been wonderful and as witnessed by the current rate of Granada Business Improvement District stakeholder approval in it's current renewal campaign and at an all time level . 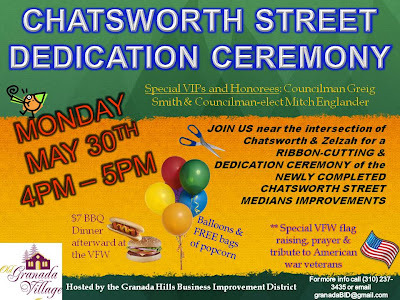 And Smith and Englander are "special VIPs and honorees" on Memorial Day - of all days - for what, exactly, John? Memorial Day is to remember those who died in service to this country, remember? And as far as "community and volunteerism" goes, how are the dynamic duo doing on getting the Sepulveda VA hospital renovated? It has only been a decade and a half since the 1994 quake, after all. Did Smith ever call up the VA when Bush was in the White House? How about Englander - he's a Republican, too, after all, right? See "Fighting for Sepulveda VA hospital's return" by Dennis McCarthy, Los Angeles Daily News, Nov. 4, 2009, for the story on how much attention your "honored guests" have given something that impacts the lives of real heroes over the past umpteen years. How does anonymous count only three shooting wars? Which ones don't count ? WWI, WWII, KOREAN, VIETNAM, GULF, AFGANISTAN, IRAQ? The US is currently involved in three conflicts - Iraq, Afghanistan, and Libya. Remembering those who have died in service to our country in every conflict is waht Memorial Day was created for, of course; but one would think that the regular notice of lives lost in the current conflicts would have engendered slightly more thought about "hurray for the BID" day this Memorial Day than in, say, 2000.